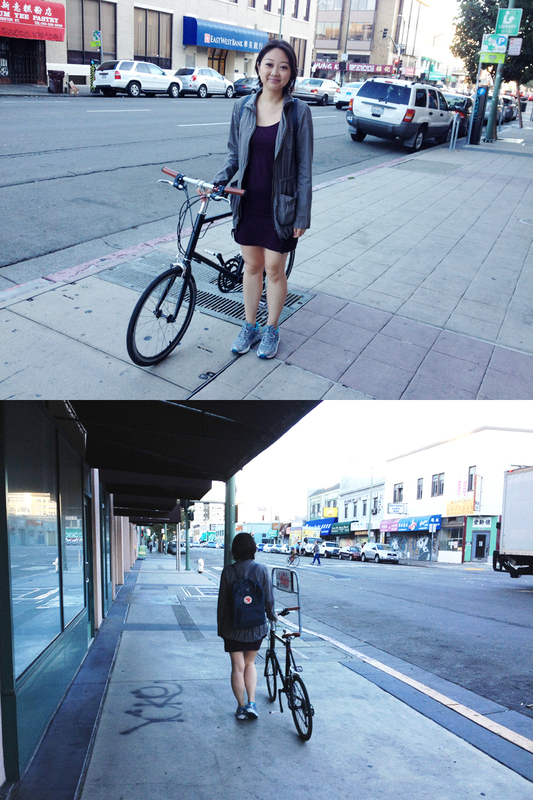 Since our move to Oakland a couple of months ago, we have spent many weekends exploring the city on our bicycles and found that Oakland’s Chinatown does indeed have many great and inexpensive casual Asian eateries. It is also very accessible for us to get there from where we live. 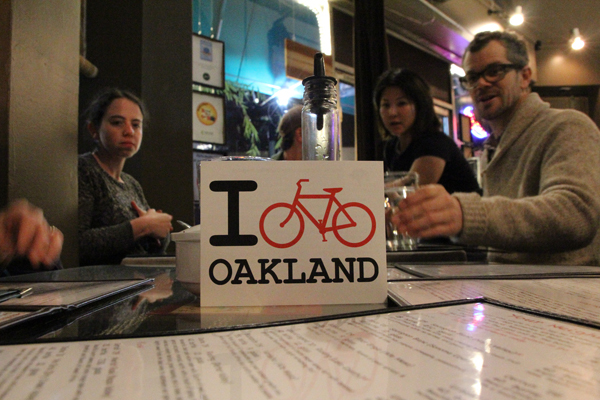 So one day, to our wonderful surprise, we discovered this Vietnamese restaurant that not only serves my favorite dishes but is also supportive of the bike community. For me, it’s like a match-made in heaven! 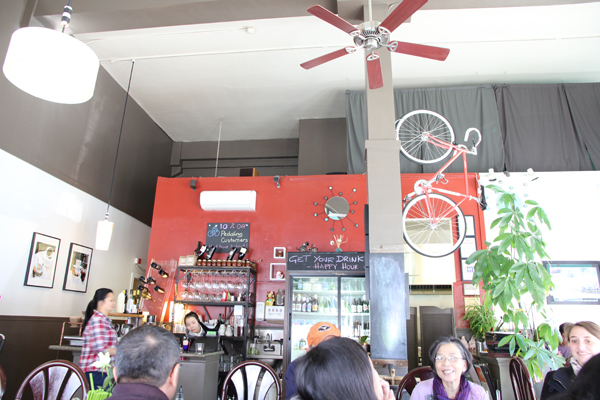 Vietnamese is one of the cuisines I grew up eating, is one of our favorites to eat in the Bay Area, and it is even better that a family-owned Asian restaurant like this one shows support of bicycling as a means of transportation. Tay Ho Restaurant is at the corner of Webster and 12th Sts. in Chinatown. 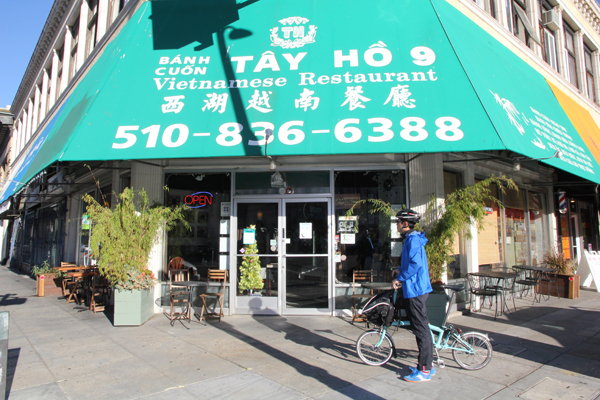 When we discovered this place, we quickly found ourselves sitting at a table inside Tay Ho Restaurant (344 12th St.) where they serve northern Vietnamese cuisine. 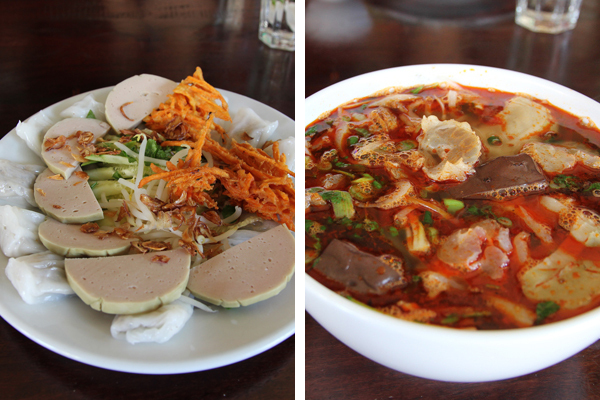 They specialize in “banh cuon” which stands for hand-rolled rice noodles and “bun bo hue” which is a popular spicy beef noodle soup (not to be confused with the widely-known “pho” which they do also serve). Many of their dishes are from authentic family recipes and it is the proprietor’s mom who is cooking in the back. When it comes to ethnic food, you know it is the real deal when the dishes are coming straight from the momma. We tried both of their specialty dishes and they were delicious. They also have really great local beer which seems to go well with the food. They have a Yelp rating of 4 stars based on 225 reviews. Not only is the food delicious and gets two thumbs up from us, but like I mentioned before- they are a bicycle-friendly business! What does that mean? Well, they offer a 10% discount off your bill if you bike to the restaurant. (Note: Helmet is required to get the Pedaler’s Discount.) 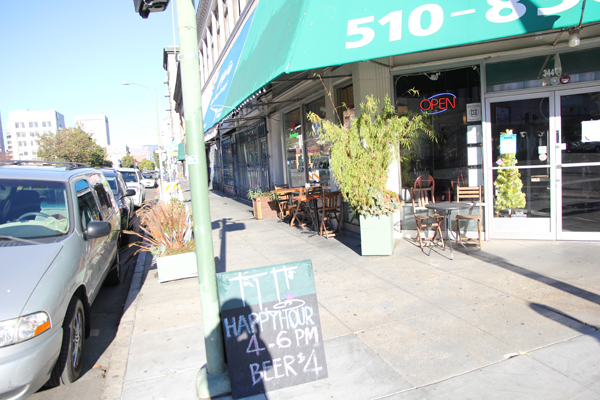 The proprietor contacted the city and requested multiple bike racks for the front of the shop. So instead of the usual one or two racks you might occasionally see in front of some businesses in Oakland, they have five. 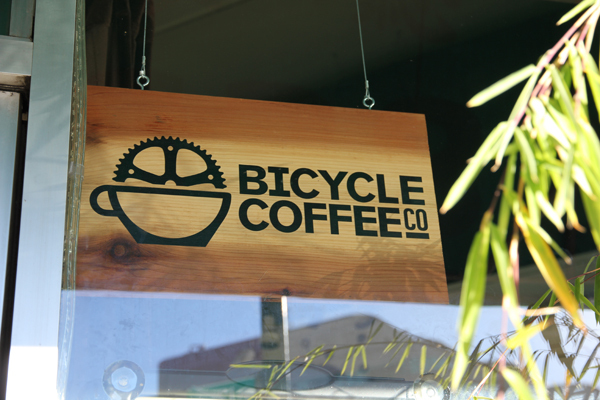 They also serve coffee from Bicycle Coffee Company, a local coffee roaster that delivers their products by bicycle. Bicycles are also aesthetically featured in their decor. The restaurant is made distinctive with their red Fuji fixie hanging in the middle of the restaurant and on the walls of their restrooms, they have framed photographs of people in Vietnam riding bicycles. When we saw all of this at their restaurant in addition to the great and authentic Vietnamese food, I told myself I just have to meet the owner of this restaurant. Luckily, the proprietor Denise was working there that day and she was really cool to chat with. 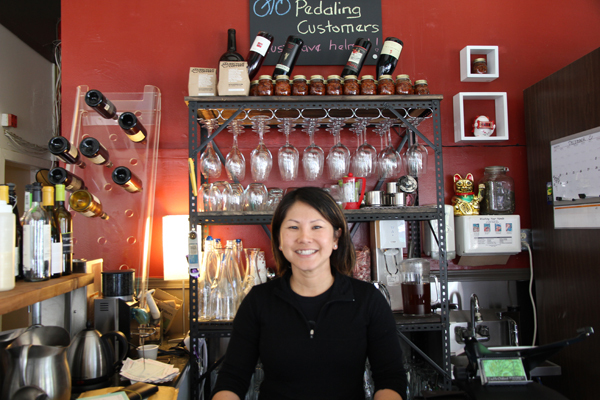 In addition to being the owner of a Vietnamese restaurant, she’s an avid cyclist and a bike safety advocate. I asked her why she supports the bicycle community and she said that besides being a cyclist herself, bicycling makes the community better. I agree! Here is Denise, the proprietor of Tay Ho Restaurant. Outside seating wraps around both sides of the restaurant and there are planters to make sitting there pleasant. Various types of seating for all types of customers. 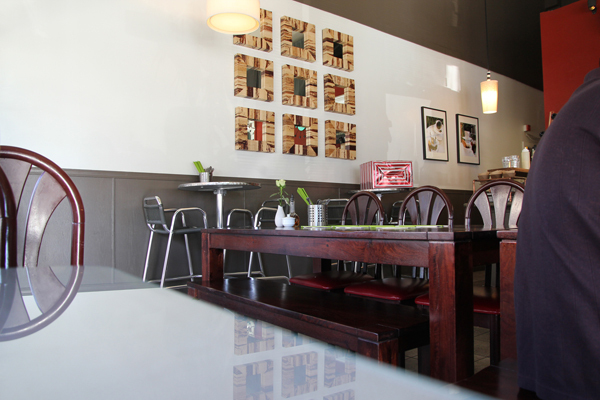 Barstool tables, picnic tables, and regular height tables. Yes, my favorite object is hanging on the support column. They source their coffee from a local vendor, Bicycle Coffee Co. I have to try this the next time I go back. 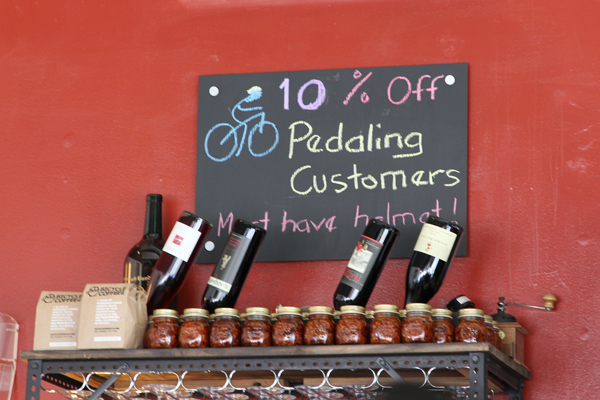 10% off to pedaling customers with helmets. We dined here after Susan’s Memorial Ride. 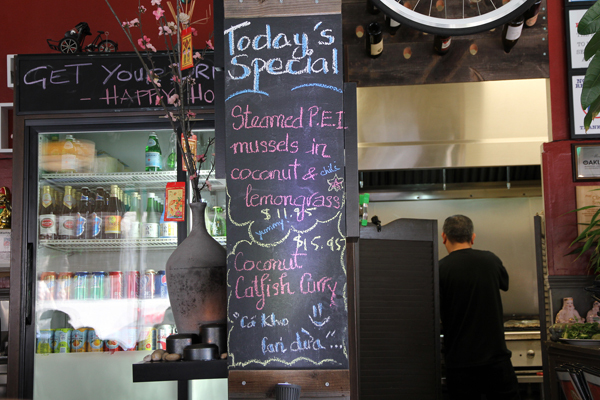 So bicyclists, if you are hungry for some delicious and authentic Vietnamese fare, ride on over to this bicycle-friendly business and you will be very satisfied that you did! Slurp!